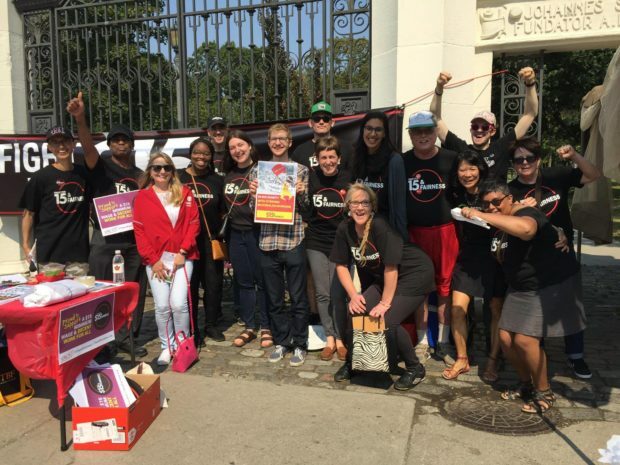 Join $15 & Fairness on Labour Day in Toronto – Monday, September 3! The Workers’ Action Centre and our allies in the fight for decent work will be leading the Labour Day march this year and also organizing to get support from unions to make sure Bill 148 is not taken away by the new Ontario government. If you won’t be in Toronto or at another Labour Day parade, you can still collect some signatures on this $15 & Fairness petition, and mail them in or send a photo of each page to info@15andfairness.org. It’s critical that we mobilize as many workers as possible to get involved in our collective fight to ensure the $15 minimum wage and new scheduling rights come into effect on January 1, 2019 and that Bill 148 does not get cancelled. A government that claims to stand for “the little guy” should not want poverty wages, but should instead allow the minimum wage to rise to $15. Yet they have already made cuts to welfare increases and other plans meant to reduce poverty and its negative effects. Workers cannot stand by and let our government scrap workers’ new rights. Support for a $15 minimum wage is strong. A recent Angus Reid survey shows that 66% of people in Ontario want $15. This support is well-placed considering that the evidence also supports increasing the minimum wage. Statistics Canada’s Labour Force Survey, July 2018 says Ontario is leading the nation in job growth six months after the 21% increase to the minimum wage. Despite the fear-inspiring headlines that workers would lose jobs, the numbers show that raising the minimum wage doesn’t hurt the economy. 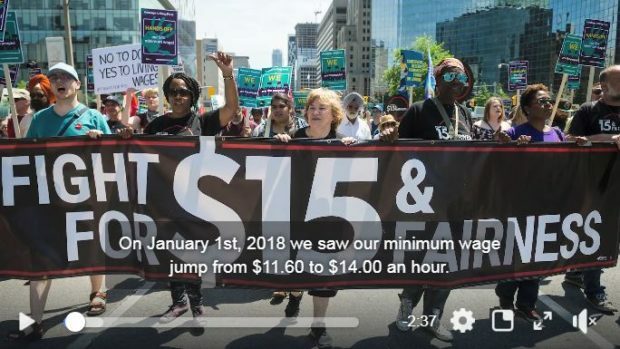 Click here to share the new $15 & Fairness video on Facebook. The truth has finally hit the headlines. A Globe and Mail article published August 10 says 61,000 new jobs were added in July, and the unemployment rate fell from 5.9% to 5.4%—“the lowest level since 2000.” This Huffington Post article recalls all the banks and big businesses that tried to stop the minimum wage increase with scary headlines, and reports that “six months later, there is no sign of the wage hike having negatively impacted job creation in Ontario.” RankandFile.ca’s David Bush takes a look at the past studies that have now been discredited by this reality: “Since February, a month after the minimum wage increased by over 20 percent, over 130,000 jobs have been added. The unemployment rate has hit an 18-year low.” The Toronto Star also reported on the tangible benefits of the increase such as higher sales in the Ontario food industry (including at restaurants that tried to offset the increase like Tim Hortons and The Keg Steakhouse). Now armed with this truth, workers and our allies must be the voice of change. Join us as we visit and call our MPPs to demand that they do the right thing: maintain and enforce Bill 148. These new laws are informed by the lived experiences of Ontarians stuck in precarious work. Let’s protect our $15, fairer scheduling, paid personal emergency leave days and all the workers’ rights we’ve won! To see where you can join an action in your area, visit 15andFairness.org/events or check out the Facebook page here: @Fightfor15andFairness.